(Newser) – "We have reached a bipartisan agreement that keeps the congressional review process absolutely intact, full of integrity." 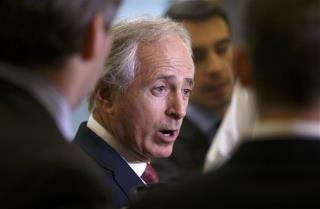 So said Sen. Bob Corker this morning in revealing that the Senate Foreign Relations Committee's Republicans and Democrats have arrived at a compromise on a bill that would give Congress the chance to review any Iran nuke deal—setting the stage for a possible veto ... and veto override. The White House has long maintained Obama would stop such a bill, but the New York Times reports that Senate Democrats hope an "overwhelming vote" this afternoon leads him to re-examine that decision. The committee will vote on the bill at 2:15pm, reports Politico, and it's expected to have no trouble passing. All they are arguing about , is how long it will take Iran to begin building bombs, for their new missile program. Obama is a pathetic coward, and millions will probably die because of it. It just sounds like congress want a chance to screw everything up. They made it clear that they weren't able to add anything intelligent to this so now they want to be able to scrap any agreement because Obama supports it.